I will be running my first modern calligraphy workshop on the beautiful Isle of Portland on Saturday 8th June, 2.30 - 4.30pm, taking place at White Stones Art Gallery. White Stones Gallery is an inspiring arts cafe with great food and refreshments to enjoy, filled with art from local artists, which is a renowned tourist location to recharge and enjoy art. They have recently built some eco B & B’s, as well as a new workshop space, which I am really excited to try out! I love when I see my illustrations in print, whether it’s on a sticker or a beautiful piece of fabric, its so satisfying to pick up a design as an object that can be enjoyed. I got them printed with a company called Awesome Merchandise, I’d definitely recommend them for fun merch ideas, like badges, stickers etc! Here is one of my designs in response to the ‘Frames of Reference’ project, aiming to engage the community of Amesbury with Wiltshire’s heritage sites. I went to Avebury stones and spent time sketching and observing how people and every day life exists with the ancient stones in a modern day context. I wanted to create a colourful design that illustrated Avebury stones in a way that local people could relate to, and a tea towel design seemed like a big blank canvas which also has a function in the home. The Red Lion pub seems to be a hub of activity and socialising within Avebury, so I thought it would sit well within the middle of the design, it is such a beautiful building too. Anyone who has been to the Avebury stone circle will know how the sheep happily graze away around the stones too, it’s such a unique setting, and the stones themselves have such a presence, people spent minutes gazing upwards infront of them at their beauty. It was fun to create my own hand lettering too, I put my skills learnt to good use from the sign writing ‘Better Letters’ course I went on last year. Below is an image of me holding a printed sample, I’m happy with the quality so should be getting some more printed soon! Im really happy to announce I have been awarded an Artist Bursary from Gingko Projects, funded by Bloor Homes as part of the public art commissioning programme for the King’s Gate development in Amesbury. I will be working on some new surface pattern designs until December 2018, with the aim of creating work with a narrative celebrating modern day life co-exisiting with the Heritage sites here in Wiltshire. Of course, I will have strong influences from our natural world, and I'm excited to conduct some research into the unique wildlife to this area and create designs in response. I intend to screenprint the final designs onto fabric, wallpaper and produce limited edition prints. First stage: research, sketching, research, sketching!! Thank you Salisbury Life magazine for featuring me on your Q&A for 'Salisbury Lives' in Junes issue! 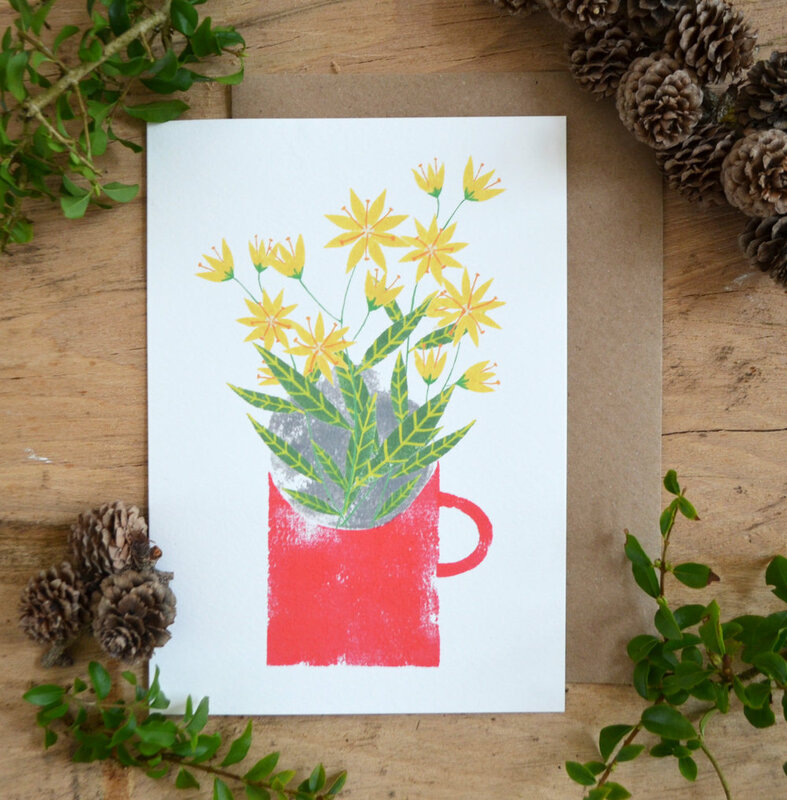 New greetings card designs along with some spring designs now back in stock! These handmade stone panels will soon be on my etsy shop, do keep an eye out! My illustrations are digitally printed onto the stone surface, encased within bespoke wooden frames. New workshop dates for 2018! my first two workshops of the year will be on Thursday 1st February & Thursday 15th February, 6-8pm at Fisherton Mill Gallery in Salisbury. Do email me for more information or to book a place. My Christmas cards and mugs are now available to purchase. I'm particularly pleased with my new Christmas mugs 'Joy to the Natural World', its safe to say you can enjoy a good cuppa out of it as I have tried and tested it! The bone china means its nice and thin. Do get in touch if you would like to purchase any, cards £2.50 each and mugs £10 each. I had great fun working on this woodland nursery mural for baby Casey. We decided to go for a reduced colour palette which adds a quirky twist to the owl, leaves and mushrooms. The solid white trees stand out against the grey which creates a lovely feeling of depth, hopefully Casey will enjoy this in his first few years of being in the world! Do get in touch if you are interested in having a mural commissioned. It also doesn't have to be on such a large scale, just a little animal or single tree can be a great edition to make any room unique! I'm super excited to tell you about the collective I am part of, Sesame Drawing Club. We are 6 illustrators who met on our MA Illustration course at Camberwell College of Arts. We've been working on lots of exciting projects, including risograph zines and taking part in markets and fairs. Sesame is a collective of visual artists based in London. It was created out of a need to combine our many interests with strong, fun and peculiar storytelling. Sesame is made up of a diverse set of women illustrators from different parts of the world trying to nurture a space that echoes and celebrates that diversity. Sesame are Anja Susanj, Hammer Chen, Gitanjali Iyer, Francesca Mclean, Hannah Redpath and Georgie McAusland. Today has been a weird mix of emotions, we have taken down the show, which was sad as I have realised its all coming to an end. I also received my MA mark, I'm ecstatic that I got a Distinction! This has really given me a boost in confidence, and I'm excited to go onto the next stage, produce lots of new designs and products and get my work out there. The Private View on thursday was great - the building was packed, and we had great feedback on the show. The great thing about the MA graduates this year is we are all so diverse, and this was reflected in the publics engagement and enthusiasm for the show. It's sad to say goodbye to Camberwell, but I have made some great illustration friends in my peers and the tutors. Onwards and upwards! I can't believe it has come around so quickly, but the Private View for MA Illustration is tomorrow night! The show will run from Friday 15th - Wednesday 20th July, if you would like to see what I have been up to over the past year, plus amazing work by other illustration graduates please come along! MA Book Arts and MA Printmaking exhibitions will also be on display, its going to be a great event.